"After becoming gay, Superman's voice and posture changes. His lips purse, his toes point inward, and his wrists become limp," says blogger Jamie Lee Curtis Taete. 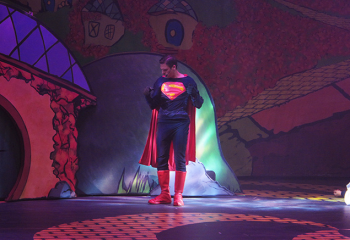 Universal Studios Hollywood was, until recently, running a Bill and Ted Halloween Horror Nights show, but that all came to an end when it turned Superman gay by sprinkling him with fairy dust. You can probably guess what happens next, but if not, Vice blogger Jamie Lee Curtis Taete has a handy fact sheet. "His lips purse, his toes point inward, and his wrists become limp," says Taete. "His new voice sounds like a homophobic uncle doing a drunken impression of Richard Simmons, complete with lisps and frequent use of the word 'faaaaaaabulous!'" Universal, after what it describes in a press release as "thoughtful consideration," has cancelled the act. "This decision falls in line with NBCUniversal's history of including groundbreaking and positive depictions of LGBT people across its brands," says GLAAD Spokesperson Wilson Cruz. The Superman sub-plot starts when Bill and Ted recruit him to help them fight witches in the Land of Oz, but after the fairy dust incident all he wants to do is molest Bill and Ted. Shortly thereafter, while aboard the Starship Enterprise - yes, I know - Superman encounters George Takei, who takes the Man of Steel offstage "to boldly go where no man has gone before," says Taete. That's the last the audience sees of him. That's not the least of it by any means - Taite's full description's over here - and it's not surprising Universal pulled it. With a bit of luck, it might remember that 'thoughtful consideration' this time next year, when it holds the next stage show.